Fabric: Daisy Janie's Geo Grand Crystal Ball. What better way to start the new year than with a tutorial? And an easy one, too. This pattern is based on the traditional shweshwe panel skirt: shweshwe fabric is often sold as pre-printed panels, and you buy as many as you need to make a skirt or dress. What I love about this method is that it's minutely adjustable to your perfect fit. I found that 7 panels made a good skirt for someone who measures 'medium-medium-medium'; if you add more, you'll have a more flared skirt. And presumably if you're really really thin, you might be able to get away with 6. This is the size of the usual panel, measured without seam or hem allowances. Draw it up as is to get the shape of the panel correct. Measure your hips at the widest part, divide by 7 (or the number of panels), and mark where the panel is that width. Cut 7 pieces; cut notches to mark the hip line. Sew all the pieces together, leaving a gap at the back for the zip. (Oh, yes ... sorry, you'll need a zip.) Try it on, and adjust the waist fit. Leaving the front 2 seams fairly flat, take in the other seams all round. You might need to take in more at the sides than the back, or the same amount on all the seams; however you adjust, make sure that the adjustments are symmetrical. The zip seam can be taken in, but try not to end up with too much of a curve there - rather spread the adjustment to the adjacent seams. 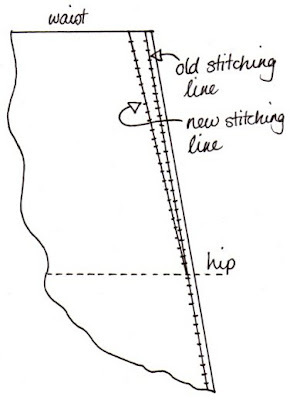 Sew the adjustments from waist to hip line, smoothing the angle to a curve. Try it on again, insert zip, turn over hem at the top, and hem the bottom. Lovely skirt! The design looks very flattering and I love the fabric. I just wanted to say how useful I've enjoyed your printmaking tutorials. I'm just starting to experiment and you've really helped. I blogged on it today and linked to you - hope you don't mind. Thanks again! Your skirt looks wonderful! I've never heard of this type of panel sewing for a skirt, so this is a double bonus post for me!! Thank you so much for posting this! I'm anxious to try it now as the look is very simple and flattering! Out of context: I love the image of you standing on the table with your hands on your hips in your Mary Jane's - "Hey Mom, look at me! I'm standing on the table! I can tap dance, too!" Looks fantastic. A tutorial is a great way to start the New Year, thank you! Happy new year! That's a really pretty skirt. ooh thanks for the tutorial. one of my to do's for this year is to make either a skirt or dress for myself - this looks just about doable - but I've never heard of shweshwe fabric (great name) before, does it have other names? Jesse this skirt looks great. I am always on the lookout for skirt patterns like this so must try it out before the summer. Now I have an excuse to find some lovely fabric! Excellent! I will try it out come (our) spring. I think this will be my first adult size piece of clothing! Thanks for your tutorial. I want to make a panel skirt but am unsure of how to cut out the pieces. Should they each be cut out along the same grain line or next to each other? Thanks. 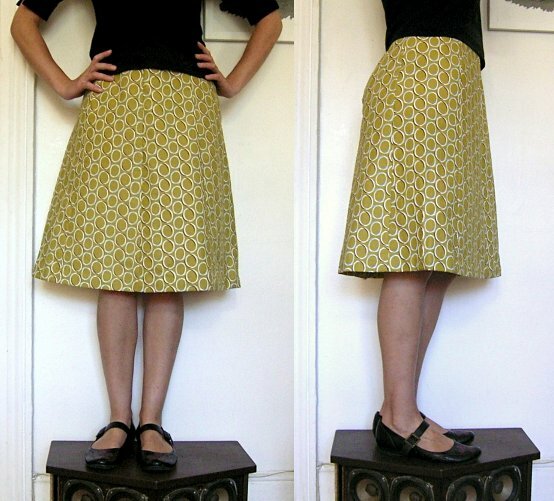 Great skirt pattern.